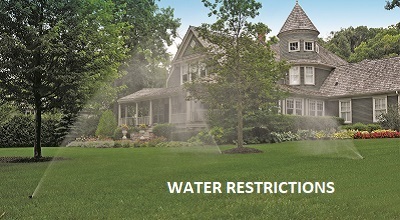 Depending on where you live in the United States, you may have mandatory or temporary water restrictions. By not complying with these water restrictions, you can face fines and angry neighbors who report you for not following these water restrictions. Moreover, you fear that if you don’t water your lawn and landscape every day, your yard will get brown and your plants will die. Plus, you’ve spent a lot of money over the years to create a beautiful property, and you don’t want it to shrivel up because of your town’s water restrictions. You don’t have to sacrifice a green, healthy lawn or say goodbye to your favorite trees, shrubs, and perennials that grace your property. Instead, you need to invest in a smart sprinkler system to stay compliant with local water restrictions and save money on your water bills. Do you feel betwixt and between when it comes to your city’s water restrictions? There are answers to your dilemma. 1. When you design your sprinkler system, make sure you have enough watering zones to ensure enough capacity, both right now and in the future. The more zones you have, the more flexibility you have to meet your watering needs. 2. You need to know your property’s water pressure. Invest in sprinklers that match the different water pressure of each zone to keep your irrigation system working at peak performance. 3. If you install or upgrade to a smart irrigation controller, you’ll be able to direct the right amount of water at the right time to your plants and lawn to keep them healthy and help them survive a drought. 4. If you upgrade or install other smart sprinkler system devices, such as a moisture sensor, you may be eligible for a rebate. Check with your city’s water supplier to learn more. 5. You can keep your landscape plants and lawn grass alive by investing in a smart sprinkler system that delivers water directly to the plants’ root system to encourage deep root growth. When your plants have deep root systems, they can survive a drought because the roots can tap into moisture stores underground. 6. You can schedule your smart sprinkler system to go off on the days that you’re allowed to water your landscape and lawn. This helps you to stay compliant with local water restrictions. Read these five facts that every homeowner needs to know about sprinkler systems. 7. You can also schedule your irrigation system to go off between the hours of 4 a.m. to 9 a.m. Early mornings tend to be the best times to water lawns and landscapes. The water won’t sit on leaves too long, there is less wind, and the sun is low keeping irrigation water from evaporating. 8. Install plants based on watering needs. This practice is called hydrozoning. You control how much water each hydrozone gets based on the plants’ irrigation needs. For example, native plants save water because they’re from your local region. They’ve adapted to the area’s dry conditions and will need less water during a drought than non-natives. You group these natives together and set your sprinkler system to deliver the amount of water they need to survive. 9. Also, the amount of sun, wind and shade determines the exact times that your sprinkler system begins and ends at different hydrozones. 10. You need to also consider the types of soil in your flower beds and lawn to determine how much water can percolate into the ground to avoid water run-off. 11. Set your timer for shorter watering periods to allow water to percolate into the soil. 12. Set your sprinkler heads to water your lawn and landscapes, not your driveway, walkways or patio. As you can see, a well-designed sprinkler system has the potential to save hundreds of gallons of water—which not only keeps you compliant with your city’s water codes but also saves you money on your utility bills. If you live in an area where there are wildfires, learn how fire landscaping can save your home and property. Whether you’re a DIY’er or you’ll be hiring a contractor to design and install your sprinkler system, you have many choices with K-Rain irrigation products. If you’re a DIYer, K-Rain sells its irrigation products at Lowe’s and Home Depot. Plus, we make installation a breeze with our online manuals that you can download and refer to when you set up our products. If you prefer an irrigation or landscape contractor to install your K-Rain products, you can call our office at 800-735-7246 or email us at customerservice@krain.com. Start complying with your municipality’s water restrictions and save money, too, by investing in a K-Rain Home Irrigation Sprinkler System. Crotta, Carol, A., “‘Smart’ Watering Systems Can Help Landscapes Survive Drought Limits,” LA Times: July 30, 2014. Irrigation Association, “Don’t Send Money Down the Drain,” Smart Water Month: Articles.